What is the difference between the pet and human brushes? Pet Teezer is owned and designed by the same authentic patented brand Tangle Teezer. The intelligence and memory in the different types of brushes are formulated differently depending on the relevant use. What dog breeds can I use it on? Pet Teezer is suitable for all pedigrees, crossbreeds & mongrels and the new small brushes mean you can find the correct brush for your dog’s size. If your dog’s fur grows you will need a detangling brush, this includes dogs with both straight and curly fur, at all lengths from short to very long. If your dog’s fur sheds you will need a de-shedding brush, this includes both short to medium flat shedding coats and thick bushy double coats. How do you use the brushes? To detangle, ensure you grip the fur through the bristles and glide the brush through the fur, as opposed to brushing over the top of the fur and not putting any fur through the bristles. To de-shed short to medium flat coats, keep the brush flat on the coat, remaining in one area make several brush strokes in the opposite direction of fur growth. This will lift the fur and expose all the shedding fur that is trapped at the bottom. Next, make brush strokes in the correct direction of fur growth over the same area you just lifted. The loose fur will then be taken out of the coat and into the brush. To de-shed thick bushy double coats use the same technique as you would to detangle, the shedding fur will be removed in the de-shedding brush. If there is an area on the top back that is flat, use the flat technique from the "short to medium flat coats" guideline above. Can you use them on dog’s ears? Yes. 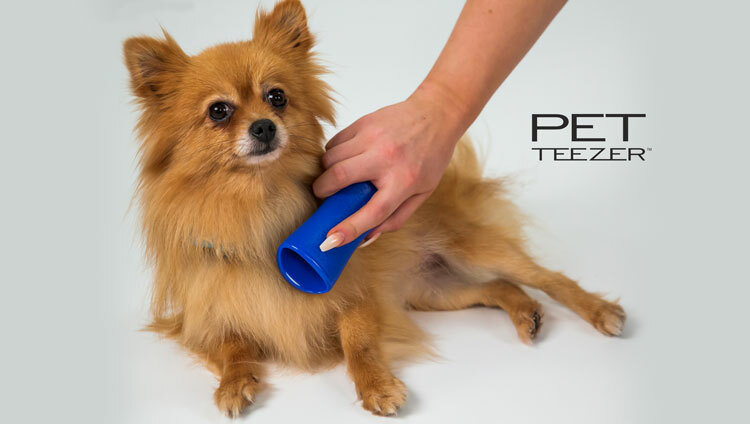 The Pet Teezer brushes are safe to use anywhere on the dog’s body. It is safe to use them in any direction because they are not metal and non-bladed. Ensure you get down to skin level where the tangles start to form and learn the correct technique for your brush to be effective. No. The intelligence in the bristles are strong enough to grip on to the fur yet have flexibility to release to stop any tugging at the skin. They will not puncture or cut the skin as they are not metal or bladed.